At one time in my career, I took care of many perennials for the sun, as I managed the perennial department of a large nursery. I was in charge of the care of the perennials, ordering the inventory, and making sure things looked great. Because of this, I was able to monitor the health and beauty of all the perennials we sold. During the long season, I was able to see that certain perennials looked good all the time, while others did not. foliage that looked nice at the start of the season, but then deteriorated. Because of these observations, I now try to use perennials for the sun that look great throughout the season. 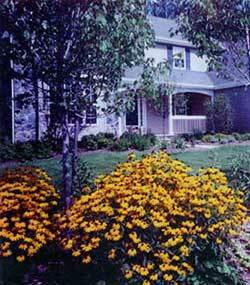 They are fairly low maintenance perennials, as it is not necessary to remove many dead or brown leaves. Removal of the finished flowers is all that is required, and you do not even have to do this if you don't have the time. Tip: If it is a very hot summer and your perennial plants start to look dry and sad, cut them down to about 4 inches tall (yes, that's right!) and they will create attractive new growth. They may or may not flower again, but at least the plant will look nice for the rest of the season. Sedum 'Autumn Joy' - This perennial blooms late summer/early fall. Yet prior to flowering, the leaves look great. This plant is a succulent with wide heavy leaves, and therefore provides nice texture against the foliage of other perennials. It is practically fool proof and great looking too! Who can resist Coneflowers. They have daisy like flowers in fabulous colors. Some varieties like a touch of shade while others, such as 'White Swan' flourish in tons of sun. I am partial to the pink colors, although I had a white one once that was very striking. Photo from my garden. 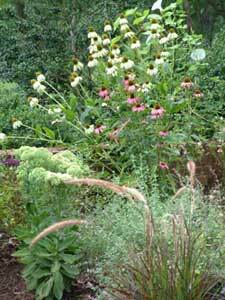 Here is a photo of a section of my perennial garden a few years ago. They are all perennials for the sun. 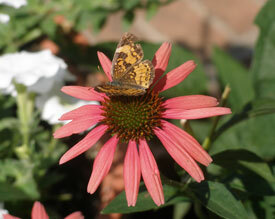 You can see both white and pink Coneflower towards the rear. To the left is Sedum 'Autumn Joy' (discussed above). This is starting to bloom but its color (pink) has not appeared yet. Purple Fountain Grass is in the front. This particular ornamental grass is an annual in most climates...so don't be fooled! However, it is worth it to have it for one year due to its lovely purple foliage. Black-Eyed Susan - When many of the flowers are finished, this full sun perennial shows off with its vibrant yellow golden color. 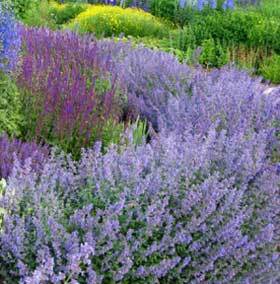 It is not as drought tolerant as many of the others in dry times but is very showy. This full sun perennial is a medium height plant and looks good when planted in masses so that the color really pops...the more the better! This is a great fall blooming perennial. Notice how it really stands out in the landscape. Until it bloomed, it still had nice foliage and was attractive. Catmint 'Walkers Low'Catmint plant is a must have in my book! Its soft blue flowers are on the plant almost all season!It is one of the most low maintenance perennials for the sun. It is completely drought tolerant.Did I mention how pretty and colorful it is?It looks great with roses too. Daylily - This plant comes in so many colors (the flowers) and sizes that it is hard to imagine not finding one you like. However, it does like lots of water and the deer love them...those are the negatives. Another great perennial. It does not flower in the traditional sense, but it does get beautiful plumes late summer and early fall. 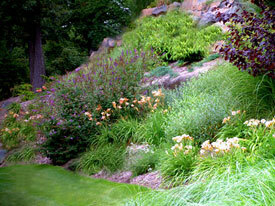 Read more about ornamental grasses and see photos. 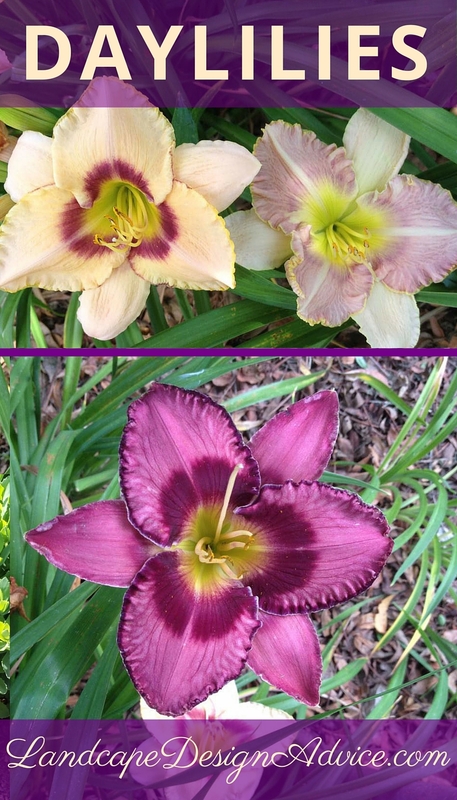 Daylily - To have beautiful color during the hot summer months, add a mass (or even one) of Dayliliesl to your garden. The flowers are very showy. Although each flower only lasts for a day, there are more ready to pop open the next day! Maiden Grass - This grass is very similar to Fountain Grass but it is quite a bit larger. The straight species gets to be about five feet tall. You can even use this perennial for privacy if you don't care about screening int he winter. "morning Light' is a nice variety with very subtle light and darker green striped foliage. 'Zebra' grass resembles...that's right...a Zebra's coloring...quite different looking! Lady's Mantle - Sometimes a plant with striking foliage is wanted as a nice texture next to another plant. This perennial's foliage is outstanding! It has wide leaves, almost like small oak tree leaves. When it gets wet, droplets form on the foliage and glisten! Peony- Peonies are more like a shrub, so if you are looking for one of the larger sized perennials for the sun consider these. There are many different flower types and colors. When in bloom they are very showy. I once had a client that lined her driveway with them and when in bloom were breathtaking. Honeysuckle 'Heckrotti' -(flowering vine) - If you need a vine for an arbor, fence or trellis, this is a lovely choice. The flower colors are pink-golden. It has a fairly long period of bloom and the vine itself is attractive. Salvia - This is a very showy perennial. 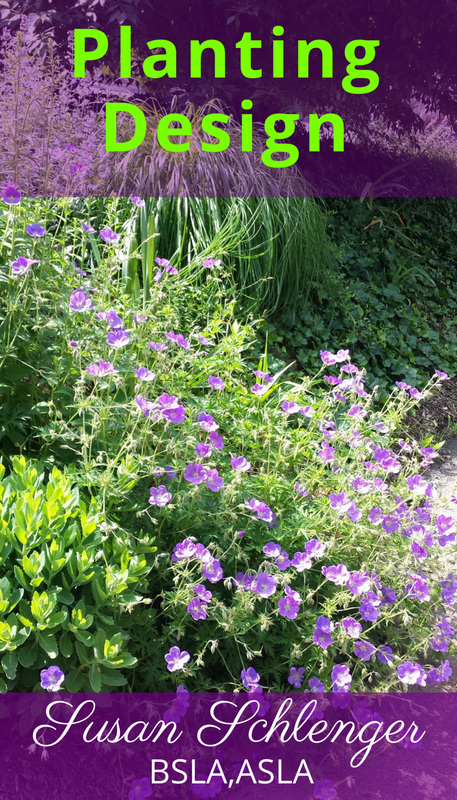 The purple colored flowers are very strong and will make quite a statement in the landscape. Pinch the flowers back as they finish and more flowers will appear, making it a long lasting flower producer. If you plant a bunch of them together, you will be amazed at the color that will be created. Lamb's Ear - For interesting texture and leaf color, Lambs Ear is a good choice. The foliage is a light green and it is...fuzzy! It prefers normal watering conditions...not too much and not too little. Very tall flower spikes will appear. Be careful where you plant this as the bees love these flowers. But do consider it next to other plants for an overall interesting landscape design. Thyme - This is actually both an herb and a perennial...and what a winner. The best thing about it? Leave it alone and it flourishes! It's extremely drought tolerant. It even flowers too! How Much Sun Is Required? Most perennials for the sun, will do well if they have sun for half a day. If they have more, or all day, that's fine also. Some perennials do well in drought conditions, and are good selections if you want to work with xeriscaping. Others require sufficient amounts of water to look their best during hot spells.